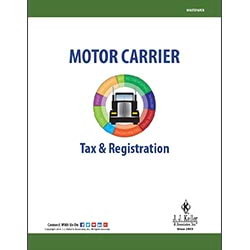 Some of the more complicated commercial motor vehicle (CMV) rules and regulations revolve around trip permits, IFTA fuel tax, fleet taxes, and vehicle licensing. Along with Federal laws and regulations, carriers must also be aware of the legal requirements each state imposes on CMVs, such as state-specific size/weight limits and intrastate operating authority. Keeping your fleet of vehicles and equipment legal and working toward your financial success takes knowledge of tax laws, state-specific rules and processes, and the time and resources to do it right. Click here for a free Webcast Download - "IFTA & IRP: What You Need to Know"
Learn about some of the most common tax and registration requirements, including IFTA, IRP, HVUT and more.